Taste test: There are lots of barbecue chips out there, but most of them are pretty much the same. These aren't. They have a great taste of honey and molasses, and they have some good kick to them without being so hot as to overpower your lunch. 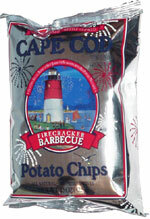 Thanks to their Cape Cod kettle-cooked heritage, the chips are wiggly and crunchy. Smell test: Very nice sweet barbecue smell.